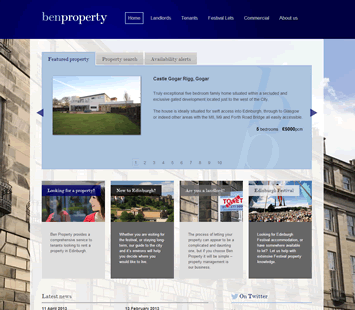 Ben Property are a successful boutique letting agent who specialise in Edinburgh residential and festival property. They had an existing website that had served them well, but needed a refresh to make the most of advances in web design and also to match their new branding. After working through a number of potential designs in late 2012, the client selected the final look and we built a custom WordPress theme for the new site. A key aspect of the new site was high quality imagery. Ben Property aim at the upper end of the letting market and use high resolution cameras to present the best impression. We included a responsive image gallery that loads smaller sized images for a slideshow, and then loads larger images when the user wants to see more and clicks on an image. Ben Property are established users of CFPwinMan and a key requirement of the new site was the ability to import property data and images from CFP. By writing our own custom plugin, we were able to add this functionality in a very modular way. The import functionality supports FTP uploads, or drag and drop uploads via a browser and carries out all the necessary steps, such a Geocoding the properties for use with Google Maps, creation and attachment of images for display in a slideshow/gallery, etc. You can find more information about the CFPwinMan WordPress plugin here. If you would like to license the plug in for your own site, please get in touch. In addition to the CFP import, another key requirement was for email availability alerts. Site visitors who are property hunting can register their interest in a particular type of property and receive an email when new property matching their criteria is added to the site. Part of the data import process involves “geocoding” the properties so they can be plotted on a map. This simply means that the address and postcode are converted automatically into latitude and longitude co-ordinates that Google Maps can use. We developed a search results page that allows users to view matching properties in a list, or plotted on a Google Map. By using some of the more advanced features of Google Maps, matching properties that are very close together are automatically clustered and shown with a number marker to indicate how many properties are in that area. Clicking the marker or zooming in will show the individual properties. 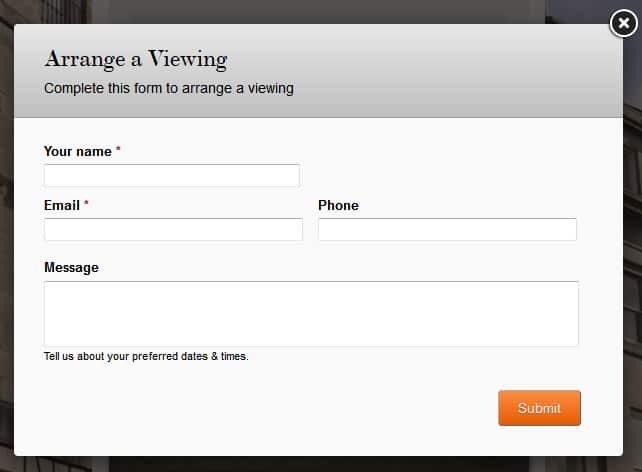 Rather than disrupt the flow by forcing users to complete a form on a separate page, we implemented pop-up forms that work on desktop and mobile browsers. This means leads can be captured “in place” without disrupting the browsing experience for the user. 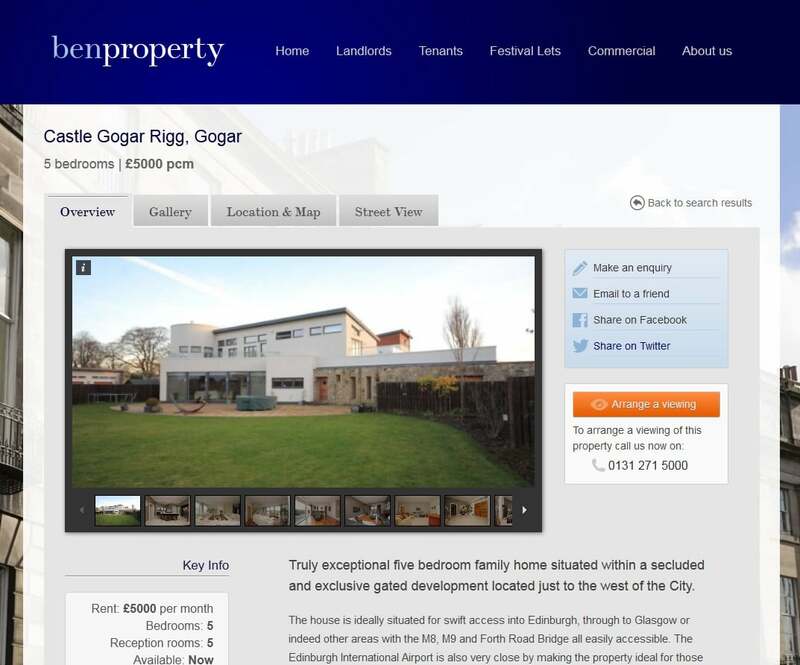 We have developed expertise building WordPress based websites for the property sector. We can offer easy to use, cost effective property WordPress sites. If you need a new site that can import from CFP or Citylets, send email alerts or simply allow property upload and searches, please contact us for a no obligation quotation.